Racine WI takes its name from the French word for 'root'. It is located at the mouth of the Root River. The first Europeans to enter the Root River were French explorers in 1699. However, a permanent settlement was not established until the 1830's. An interesting aspect of Racine's history was its strong anti-slavery stance in the years leading up to the Civil War. In a famous incident, a run-away slave living in Racine WI was arrested by U.S. marshals. A crowd of approximately 5,000 local citizens mobbed the jail and freed him, sending him on to Canada. Racine WI has a strong manufacturing tradition and that made its harbor commercially valuable. However, in the late 1980's, the commercial use was scaled back and the harbor was redeveloped into one of the finest recreational harbors on Lake Michigan. Racine WI has the largest Danish population outside of Denmark and it was here that the delectable Danish kringle was created. Whether coming from the north, south or east, care needs to be taken when approaching Racine WI. About 3 nm north of Racine harbor is Wind Point. Generally, stand off from the coastline north and south of Wind Point. There are a number of charted obstructions along the coastline and many sailors have come to grief as a result of coming too close to the shoreline. Chief among these hazards are Wind Point North Shoal and Wind Point South Shoal The North Shoal is marked with a lighted buoy (R14) with a Fl RED light. Pass well to the east of it as you run south towards Wind Point South Shoal. The South Shoal is marked with a RED lighted buoy (N16). Give it a wide berth and continue south until you can alter course and come in to the harbor entrance on a course of approximately 235°T. The major obstacle here is Racine Reef This is a large reef formation that lies just off from the harbor entrance and little to the south. It is a serious hazard to shipping and is marked at both its eastern end (RACINE REEF LIGHT - Fl WHITE visible 8.26 nm + horn) and on the western end (G1 - Fl GREEN). Your options are either the .4 nm gap between shore and the G1 buoy or leaving the Racine Reef Light on your port and coming around the east and north side of the reef. The hazard here is again Racine Reef. The best thing would be to set a clearing line and then monitoring it to ensure that you do not stray too close to the reef. There is a good discussion about clearing lines here. The harbor entrance is entered on a NNW heading. It is marked on the north pierhead with a Q RED light visible 8.26 nm offshore + horm. The south pierhead is marked with a Q GREEN visible 8.4 nm offshore. Once inside the harbor entrance, you will find the large ReefPoint Marina on your port and the Racine Yacht Club on your starboard bow at the northwest corner of the harbor basin. Beyond the harbor, lies the Root River. This is navigable with 2 bascule bridges crossing it. There are marinas and facilities up the river. Most transient sailors generally do not go beyond the marina immediately upriver of the 2nd bridge. ReefPoint Marina is immediately on your port when you enter the harbor basin. There are 921 slips with 100 available for transient sailors. Under new management by the municipal authority, it boasts a range of excellent services. There is a fuel dock (diesel and gasoline) and a pumpout station. Water and power are available at each slip. There are restrooms, showers and laundry facilities. There is a heated swimming pool, whirlpool, picnic areas and BBQ grills. There is also a Boaters' Lounge with TV and internet. There is also a new restaurant on-site - ReefPoint Brew House, as well as a ship's store and a deli. The marina is located just minutes from the downtown area which is easily accessed on foot or by trolley. RYC is located in the northwest corner of the harbor basin. Their slips have been completely dredged eliminating previous challenges with skinny water. They have several slips available for visiting sailors. There is no fuel dock or pumpout station. Water and power are available dockside. The clubhouse has restrooms and showers. There is a bar/lounge and a restaurant as well. There are picnic areas with BBQ grills on the grounds. Gaslight Pointe Marina is located in the southwest corner of the harbor basin, beyond ReefPoint Marina. There are several slips available for transient sailors. There is no fuel dock or pumpout station. Water and power are available at docks. There are restrooms and showers available in a modern club facility. The marina has patio areas to relax by the water, an indoor swimming pool and whirlpool. Vessels can navigate up the Root River, through downtown Racine WI, passing 2 bascule bridges. The 1st bridge opens on signal (1 long, 1 short blast) from 0600 until 1800, on the hour and on the 20 minute and 40 minute mark. The 2nd bridge opens on a signal of 3 short blasts. Pugh Marina is located about .2 nm up the Root River on the north or starboard side as you come up the river. 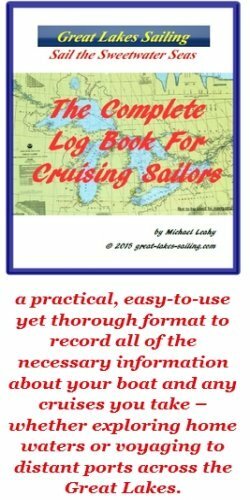 They have several slips available to cruising sailors. There is a fuel dock (diesel and gasoline) and pumpout station. There is water and power dockside. This is a full service marina able to carry out engine, mechanical and electrical repairs. There are restrooms, shower and laundry facilities. There is also a lounger area for boaters and internet access is available. Racine Riverside Marine is located on the west or starboard side as you move upstream, just past the 1st bridge. There are several slips that are available for transient sailors. There is no fuel dock or pumpout station. There are water and power hookups. This is a full-service marina able to carry out a full range of engine, mechanical, electrical and fiberglass repairs and maintenance. They also have a rigging shop. There are restrooms, showers and laundry facilities in their boaters lounge. There is also a kitchen which you can use to prepare your meals and beverages. The lounge is quite attractive and has an outdoor deck overlooking the river. HLYC is located just beyond the 2nd bridge, on the west or starboard side of the river as you move upstream. They have several slips for transient sailors. There is no fuel dock or pumpout station. Water and power are available. There is a clubhouse with restrooms and showers. The club has a lounge and a restaurant as well. West Shore Marine is the former Palmer Johnson Marina. It is located just upriver from Harbor Lite Yacht Club on the west or starboard side of the river as you move upstream. There are 30 slips with several set aside for transient sailors. There is no fuel dock but there is a pumpout station. There are water and power hookups. This is a full service marina with factory trained mechanics and technicians. They can carry out full engine, mechanical, electrical , fiberglass and canvas repairs and maintenance. Service also extends to prop work and rigging repairs. There are restrooms and showers available as well as and outdoor patio and BBQ grills. Internet service is available. Sav-A-Lot Supermarket is located about 1.5 mi/2.4 km west of the harbor. It is a large supermarket and can handle all of your provisioning needs. Chase Bank is located downtown, about .5 mi/.8 km from the harbor. It has counter service and ATMs. St Luke's Hospital (262) 687-4011 is located about 1.2 mi/2 km from the harbor. Lakeview Pharmacy (262) 6632-0520 is about .5 mi/.8 km from the harbor. The harbor area is just minutes from downtown Racine WI. There is a wide selection of interesting restaurants to try. ReefPoint Brew House is situated right at ReefPoint Marina. Newly opened in 2013, it carries quite a selection of craft, domestic and imported beers to accompany a classic American roadhouse menu. Chancery Family Pub is located in the Radisson Inn, right on the harbor. The Yard Arm Bar & Grill is a beautiful natuical-themed pub in the English tradition. Lots of seafood plus ribs, steaks and more, imported beers and live entertainment make this a favorite stop for visiting sailors. For a nice dinner out, try The Pink Magnolia. They have an extensive menu focused on natural and/or organic ingredients. For a taste of Spain, check out Olde Madrid. They have an excellent wine list to accompany a nice selection of tapas. Remember my comment above about Racine WI being the home of the Danish kringle? Well, you can't be in Racine without trying one! For the uninitiated, a kringle is a Scandinavian pretel-shaped pastry, especially from Denmark. Racine's contribution was to take a kringle and stuff it with all sorts of mouth-watering fillings. O & H Danish Bakery have been making award-winning kringles in their family business since 1949. Bendtsen's Bakery is another family-owned Danish bakery where you can enjoy this mouth-watering treat. With Lake Michigan as its backdrop, Racine WI has many attractions and events to enjoy. Racine WI is home to many of the architectural creations for Frank Lloyd Wright, the great American architect. Some of his largest works are found at the headquarters of S C Johnson. The Racine Art Museum has one of the largest collections of contemporary craft art in North America (over 8,000 pieces). The Racine Heritage Museum showcases much of the rich history and heritage of Racine, including its days as a shipbuilding center. There is live theatre, symphony and community celebrations such as the Taste of Racine, Music On The Monument free concerts and much much more. The Racine WI visitors site will give you lots of ideas on how you can enjoy your time here.